Keep your memory in prime shape by regularly eating fruits, vegetables, and proteins that are known for boosting memory and decreasing your risk for Alzheimer's disease and dementia. Foods such as avocados, sunflower seeds, and peanut butter are packed with vitamin E, which is associated with decreasing your risk for Alzheimer's. Other foods such as green tea, dark berries, and apples contain antioxidants which helps protect the brain from inflammation that can lead to memory loss, or from free radicals that can damage brain cells. 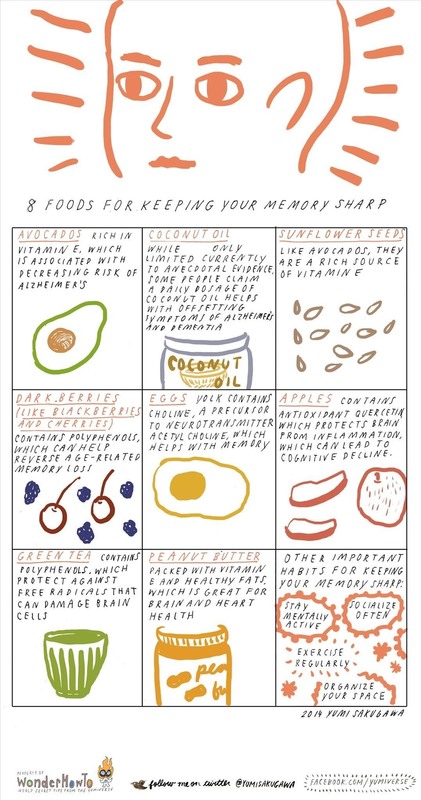 For other brain-boosting foods that benefit overall cognitive health and function, see my previous post on foods that'll boost your brain power. While diet is an important aspect of memory health, don't forget to exercise regularly, maintain an active social life, utilize mnemonic devices, and challenge yourself mentally on a regular basis, such as learning a new language!